Have you always wondered what it’s like to breathe underwater? 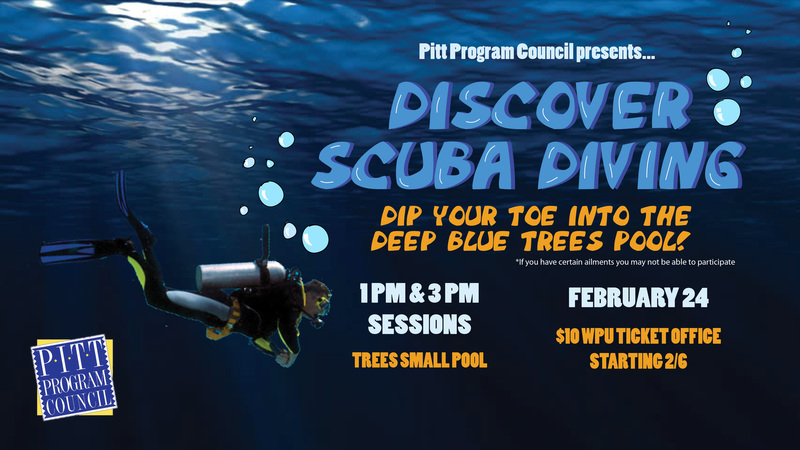 If you want to try scuba diving, but aren’t quite ready to take the plunge into a certification course, then the event Discover Scuba Diving with Pitt Program Council and Splash Scuba is for you. The event is a quick, easy, no experience necessary introduction to what it takes to explore the underwater world. You will learn the basic safety guidelines and skills need to dive under the direct supervision of Splash Scuba Professionals. The event will take place on February 24, 2019 in the Trees Small Pool. Sign ups begin on February 6, 2019 in the WPU Ticket office. Tickets are $10 and will be limited 1 ticket per Pitt Oakland undergraduate. Students can choose from a 1 PM or 3 PM session, and all sessions are 90 minutes. All Pitt Program Council events are open to all undergraduate Pitt students with a valid (Oakland) Student ID.